This CD contains the two meditations, AS I OPEN MY EYES Morning Meditation and WHEN I CLOSE MY EYES TO SLEEP Bedtime Meditation. 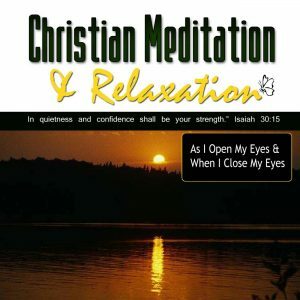 Each meditation begins with a progressive relaxation followed by biblical narrative and relaxing music. Wouldn’t it be great to begin and end your day with the Lord? Wake up to asking God to bless and guide the affairs of your day and go to bed at night blessing the world and leaving your cares with God.